Caution:Refer toMachined Surface Damage Caution. 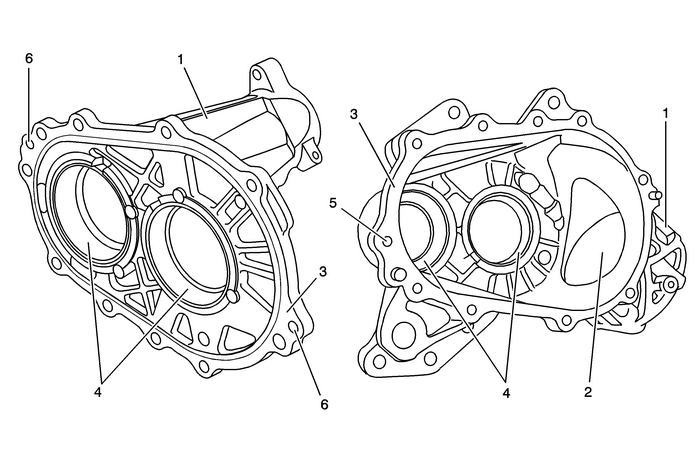 Preliminary ProcedureClean the left and right transfer case housings in cleaning solvent and air dry.The transfer case internal components are not to be serviced. If the internal componentsare damaged, the transfer case must be replaced. Note:Inspect for cracks, broken areas, or other damage. The transfer case assembly mustbe replaced if damage is found. Note:Repair small scratches or nicks with light sanding. Note:Repair small scratches or nicks with a soft stone. Note:Replace the transfer case assembly if a bearing has spun or if cracks are detected.